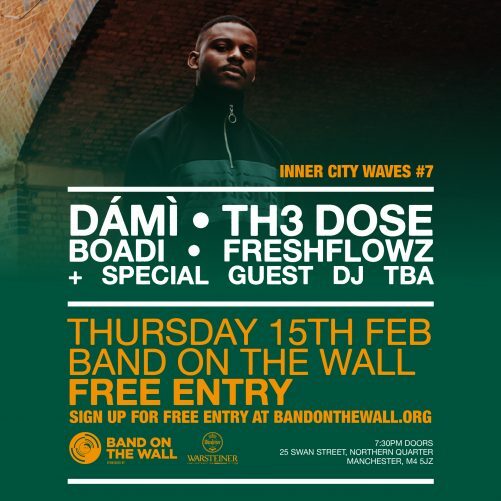 Presenting Inner City Waves #7 – a free-entry showcase of some of our favourite local emerging urban artists, featuring Damí, Th3 Dose, Boadi, Freshflowz and special guest DJs TBA. Dámì is a poet / alternative hip-hop artist from Manchester with a debut EP Crayons that is captivating ears and hearts with its ‘laid back vibes and positive messages over jazzy beats’. Th3 DOSE is a captivating urban trio consisting of three skilled rappers/producers (KGOSI, Souler, SEDDAA). Their unique sound is a blend of their individual styles resulting from their cultural backgrounds and individual musical influences, which some might say bridges the gap between the US and UK with 2 members (SEDDAA & KGOSI) growing up in Manchester UK and the third member Souler from Texas. UK rising soul star Boadi (pronounced bwer-dee) is a British singer/songwriter/producer hailing from South London. He possesses a distinct nostalgic sound that’s a fusion of R&B, Jazz and Afro-funk. Citing D’Angelo, Fela Kuti and Marvin Gaye among his top musical influences, it’s clear to see the foundations of his soulful exchanges. As an independent artist Boadi has begun to orchestrate progressive strides forward in his young career, most notably a radio debut on DJ Target’s BBC Radio 1Xtra Homegrown show, as well as featuring on Gary Crowley’s BBC Introducing London show. Boadi and ‘The Banku Powers’ (his live band) have had both an exciting 2017, which saw them perform a headline show to a sold out crowd at the Servant Jazz Quarters. Freshflowz is a Music Artist from the UK, who specialises in hip hop but is also experimental with different styles and genres. He grew up in West London & Luton and having recently moved to Manchester his performances and public awareness is gradually on the rise. He enjoys being on stage doing live shows in front of an audience as well as recording new material in the studio.